Every couple of weeks, the students at Family Matters participate in after school classes. One class that was offered was “Food to Go”. According to Temple Hickman, one of the students from the Teen Girls Program, the purpose of “Food to Go” is to take basic foods that the students eat daily and make them healthy. When asked why he chose to take this class, David Gray explained that after cooking one time with his father, he fell in love with cooking. The students from “Food to Go” decided to make nachos. As a group, they created a shopping list of healthy ingredients for the nachos. For example, instead of using concentrated cheese, the students used mozzarella cheese. For chips, instead of buying chips from the store, the students cut tortillas into small pieces and baked them. 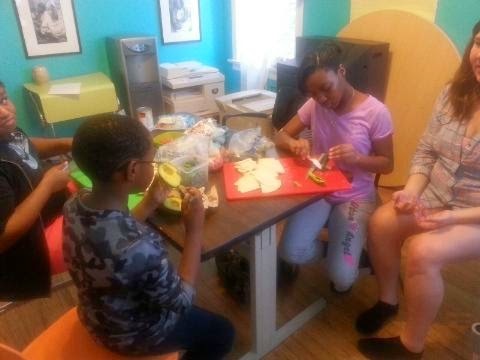 The students needed minimal assistance from the Family Matters staff; they cut the vegetables, cooked the meat, and cleaned the dishes by themselves. After the food was cooked, the students were able to enjoy their nachos, without having to worry about them being unhealthy.